A major undercurrent presented in the exhibitions Power and Piety and Molas is power. The dynamics of power in colonialization and migration are complex and nuanced and are often reflected in art across regions and time. Our panelists will delve into their own work dissecting art, power, and migration in their 15-minute talks, followed by an open forum for questions. Nestor Armando Gil/Taller Workshop is an assistant professor of art at Lafayette College and a multidisciplinary artist. The media and material Nestor uses vary widely; however, a common set of ideas thread them together. Questions of culture and place are at the center of his thoughts, which expands to inquiries about movement, memory, and loss. Working to develop poetries of image, functions, and interaction, he hopes that his work also carries moments of humor, from the dry to the absurd. Nestor’s performances ritualize acts of passage. Thus, he makes objects, images, and installations dealing with ideas relating to that theme. He is interested in the relationship/tension between memory and myth that accompanies such acts. Relying on both intuition and intentional inquiry, he traces histories of movement between and across borders in his work. Nestor employs social-practice strategies, reflecting upon the struggle to maintain a sense of community. This presents a transition between spaces–the physical, geographic, emotional, and intellectual–and alludes to the dispersal phenomenon that is part of any migration/diaspora story. Scherezade Garcia is an interdisciplinary visual artist born in Santo Domingo, the Dominican Republic, and based in Brooklyn, New York. Through her practice of drawing, painting, installation, sculpture, animated videos, and public interventions, she creates contemporary allegories of history, colonization, and politics. Garcia’s work frequently evokes memories of faraway home and the hopes and dreams that accompany planting roots in a new land. By tackling the collective memory as well as the ancestral memory in her public intervention and studio-based practice, Garcia presents a quasimythical portrait of migration and cultural colonization. 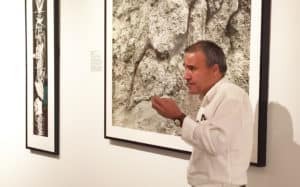 Garcia’s work is included in the permanent collection of the Smithsonian Museum of American Art, El Museo del Barrio in New York City, the Housatonic Museum of Art in Connecticut, and El Museo de Arte Moderno in Santo Domingo. 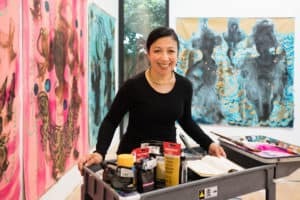 She has exhibited at museums and art centers, including the Newark Museum of Art in New Jersey and the Sugar Hill Museum, BRIC, in Brooklyn. 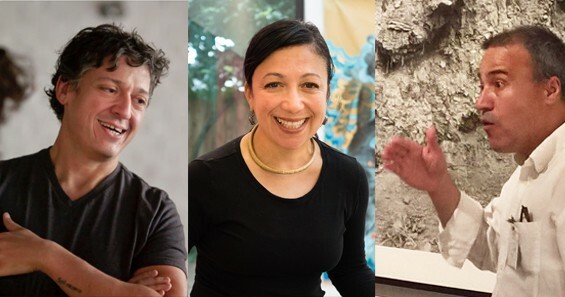 Her work has been included in numerous group exhibitions, including Our America: The Latino Presence in American Art, Smithsonian American Art Museum; Skin I’m In; Contemporary Dominican Art from El Museo del Barrio’s permanent collection; and Merengue! Visual Rhythms also at El Museo del Barrio; The Caribbean Abroad: Contemporary Arts and Latino Migration, Newark Museum of Art, Newark, New Jersey. Her most recent installation, Liquid Highway: Roots of Civilization, commissioned by BRIC, is currently on view at 80 Dekalb, Brooklyn, until March of 2019. She is represented by Lyle O Reitzel Art Gallery in Santo Domingo and is faculty at Parsons, The New School for Design, in New York. Angel Suarez-Rosado is a Puerto Rican–born artist based in Easton. As a graduate of the School of Visual Arts in New York, he has experimented with many mediums and forms in his work. Here at the Allentown Art Museum, Suarez-Rosado has created a site-specific installation in which he transforms ordinary objects, imbuing them with power, in a practice related to Espiritismo (Spiritism) and Santería. 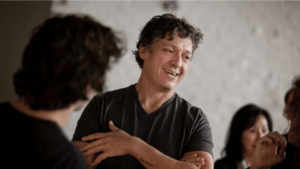 His work has been exhibited internationally, including at the National Gallery of Australia, Parsons School of Design, and the New Museum in New York. He has taught art both at the university level, at Kutztown University, as well as in the community at schools, museums, and arts centers. In addition, he has worked in the prints and drawing department at the Cooper-Hewitt Museum in New York, and his work is included in the Archives of American Art in Washington, D.C. This panel discussion is presented in collaboration with the 50 States Initiative by For Freedoms. Founded by Hank Willis Thomas and Eric Gottesman, For Freedoms Federation encourages new forms of critical discourse. Their mission is to use art as a vehicle to build greater participation in American Democracy. Since 2016, For Freedoms has produced exhibitions, town hall meetings, billboards, and public art to spur greater participation in civic life. This year, For Freedoms launched the 50 State Initiative, a new phase of programming from September through December 2018 during the lead-up to the midterm elections. Building off of the existing artistic infrastructure in the United States, For Freedoms has developed a network of artists and institutional partners who will produce nationwide public art installations, exhibitions, and local-community dialogues in order to inject nuanced, artistic thinking into public discourse. Centered around the vital work of artists, we hope that these exhibitions and related projects will model how arts institutions can become civic forums for action and discussion of values, place, and patriotism.